Out of all the essays in this terrific volume, one of the previously unpublished essays, titled “On Writing,” took me by surprise and offered me a window into Heskett’s unique perspective. In this piece, Heskett makes the fascinating link between design and writing. He explain, “I want to express my belief at the outset that no one can write, just as no one can design, without some sense of personal commitment and satisfaction.” To Heskett, both design and writing are forms of practice that do not happen in a vacuum. 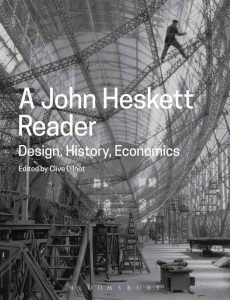 Heskett traces his own experiences with writing to his education in Britain and his initial forays into the fledgling field of design history. I especially urge students to pay attention to Heskett’s deeply personal reflection about penning his first article for History Workshop, an influential journal focused on socialist history . He notes how when his paper was published it felt like he was giving birth to “my first-born! But essentially, I was a parent who didn’t know the facts of life.” This initial uncertainty led to other instances of gaining a better sense of what it means to write about design, and to Heskett’s credit he offers details that include bumps in the road, including being redirected by an important curator of design, whose careful editorial eye ultimately made Heskett’s efforts better. Heskett concludes with sage advice, telling his audience not to be distracted by the emotional turmoil of rejection and other hindrances. In a word, Heskett tells all of us to do simply sit down and “write”!